Most everyone remembers reading Newbery Medal books during elementary school: Island of the Blue Dolphins, A Wrinkle in Time, The Westing Game, Shiloh and others. But once high school rolls around, it's all about The Classics—The Scarlet Letter, Wuthering Heights and The Old Man and the Sea. What about excellent books for young adults? Such things do exist, and beginning in 2000, the American Library Association—the same folks who bring us the Newbery—began honoring them with the Michael L. Printz Award. The 2015 winners of the Newbery, Printz and other ALA awards will be announced Feb. 2. 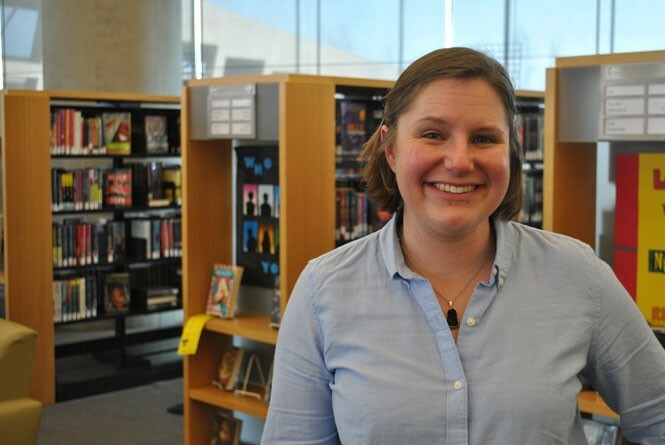 One person who will be watching with great interest is Brooke Young of the Salt Lake City Public Library, who was appointed to serve on a top-secret committee to decide the 2016 Printz winner and honorees. Young is also the manager of the new Glendale library branch, opening fall 2015. What has made you interested in young-adult literature? I started at the library when I was a teenager, so it was always there. It became really heightened when we moved into this building. When this building opened, I was on Level 2, working in the teen section, and it reignited my love of teens and teen services and young-adult fiction. How has young-adult literature changed in recent years? It's so much more acceptable to be reading teen fiction, which is awesome. And the types of books being published are more sophisticated than I think they've ever been. Also, the publishers really pay attention to what teens and what adult readers of teen fiction want. [They] are actively looking for new voices and good books in a way that I think other areas of publishing are not doing such a good job at. A debut author can get a lot of publicity in teen fiction, which is great. Why do people still look down their noses at teen books? There's a lot of old traditional publishers and writers who get a little threatened by what they see as fluff or popular things that they're not writing. Is there the sense that, "Well, this was a good book when I was a teen, and therefore ..."? "... that's what we're going to teach for the next 20 years"? Yeah, that has traditionally been the problem, but it's slowly eroding away, teacher by teacher, which is nice. How many times do you make a kid read I Am the Cheese before they decide they're never going to read again? Why was the Printz created? Printz was created as a counterpoint to the Newbery. There were all of a sudden these great teen novels, and there was no group to say, "This is the best, this is the most literary," or at least no way for the librarians to do it. The Printz has one winner, and up to four honor books. They can be from anywhere in the world, and they can be fiction, nonfiction, graphic novels ... just anything published deliberately for teens. Who is the Printz for? That's always a huge discussion. All ALA awards are, first and foremost, to help librarians make good selection decisions. Ultimately, it's for teens, and to help teens find the best teen literature. That's where the popularity grumbles and discussions happen—are we only finding books that adults like, or are we finding books that teens will actually like, too? It happens pretty often that the book that people love doesn't even make an honor. The Absolutely True Diary of a Part-time Indian is a good example of one that didn't even make an honor. Everyone knows the Newbery; what are some Printz books that people might recognize? The Book Thief was an honor book, and I think gained its popularity after it won. That year, the book that won was another Australian book by an amazing author, called Jellicoe Road, by Melina Marchetta, who is my all-time favorite author. Another great one is Nation by Terry Pratchett, a famous humorous British fantasy author. It's about two kids whose island gets destroyed in a giant tsunami, and what it means to be a nation, and build your culture, and have a history—while maintaining the funny. How can you possibly read enough books in a year to choose the best ones—and not get burned out on reading? You do have to be really disciplined and have a schedule. It's also a weird kind of reading, because you have to make sure you're writing notes. It's sort of like reading for college; you have to have opinions, and back them up. It's a slower kind of reading. I was on a committee three years ago called Best Fiction for Young Adults. And because you weren't looking for literary excellence, you had to read everything—just books you'd recommend to other librarians to buy. You had 200 nominations, plus you'd be reading to nominate. By the end of that one, I was done. I didn't read a teen book for a year. This one is a little bit more selective. You don't have to read everything. What does the committee do once your term starts Feb. 1? You watch a few webinars about the process, but the big thing is, as a committee, you have to decide what "literary excellence" means for you. And that changes from year to year, depending on what the committee thinks that is. That can be really complicated, and that's what committees spend the most time talking about. Popularity is not one of the things that the Printz considers. What is your definition of excellence? Things that I look out for and that really appeal to me are books that are well-plotted—not just complications for complication's sake, but intricately and expertly plotted. I also really love believable emotions. It's really hard for some writers to show emotions, and to have characters feel things, so that when you do notice it—like in Eleanor & Park or Jellicoe Road—it really stands out; those emotions feel real. Those two things will always make me love a book. How do you choose the winning books? The Printz has a lot of online discussion among members. The big knock-out, drag-out meeting will be in January 2016. That's when all the discussion happens, and when all the decisions get made. It's a couple of days; it's a closed-door meeting, and you have to make your case. Going to the [awards] announcement is always the best part of that January conference. You wake up really early, and it's just like 700 librarians in a giant ballroom, twittering ... you can hear the chatter and the excitement. When surprise books win, you hear gasps. These book conferences have been wildly popular with non-librarians, with teens and book bloggers becoming notorious for running through and grabbing stacks of advance-reading copies. What do you think of that? It's kind of awesome. Pew Research did a study about a year ago that looked at the reading habits of teens. Overwhelmingly, teens are still reading physical books. It's like 80 percent physical books and 20 percent e-reading. The physical aspect of the book still has a huge appeal for teens. It's part of the appeal for people, too, to have that advance knowledge of what's coming out and be able to say, "Oh, I read that first." It just creates excitement, and I think any excitement you can get for reading and publishing is awesome. What's the trend right now in teen books? There's more than one or two books right now with somebody who has cancer. There's a real reaction against paranormal, and a return to realistic fiction. Dystopian is sort of getting caught up in fantasy—it's less science-fiction-y and more fantasy dystopia at this point. What were the best YA books you read in 2014? I really liked The Belzhar by Meg Wolitzer. There was a really funny book called Noggin by John Corey Whaley; it had some depth to it that I really liked. Do you have predictions for this year's awards? I really don't. I think it's a super wide-open field. There's a book called Grasshopper Jungle by Andrew Smith that's, by far, the weirdest book I have ever read. But I think it has a shot. I also really like A.S. King's Glory O'Brien's History of the Future. You're getting your own library this fall—how did that happen? I got my first job at this library when I was 16. I was an aide in the periodicals department, which was in the sub-basement of what is now The Leonardo. I've been with the library ever since; this is my 17th year. I've just had a bunch of jobs.